The latest from Every Day Shooter developer looks to be more than an average platformer with its unique, musically driven design. Developer Queasy Games' debut focused on moving and shooting, and now their PS Vita follow-up is centered around running and jumping. Yes, that's all you do. However, the game's unique level design brings variety and rhythm (literally) into the game by connecting enemies, objects and obstacles with drum and synth sounds that make up a song. Each area of a level builds upon the next, culminating dance epics that can span anywhere from two to 30 minutes. The game will ship with 30 premade levels. Beyond unique terrain and obstacles, the game seems rather one-note. You jump over enemies, you collect stuff and then you cling to a wall. 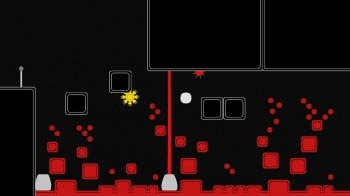 Sound Shapes will succeed or fail in the hands of consumer-creators and the game's tool set: a simple touch control-based system, where a note's pitch is decided by placing an object low or high on the screen. Then, the back touch panel is used to move the object across the screen. With 15 instruments in the demo and more possibly added before launch, the game is capable of making a variety of tunes - even if it's incapable of making a variety of stages. Each level I played sounded distinct, with its own mood and tempo. One area had a series of enemy lasers, which you could navigate around by jumping on the off-beat. Another area featured a series of blocks you could hit to make a looping drumbeat that carries on over the rest of the level. With an expanded team (seven or so staff with 10+ contractors) and a new platform (PS Vita), Sound Shapes (tentative title) might be the sort of ambitious project that will put Queasy Games on the map, beside thatgamecompany and Pixel Junk. It's not a game of great complexity or as addicting as Every Day Shooter, but its rhythm-based platforming might be enough to stand out during PS Vita's launch.